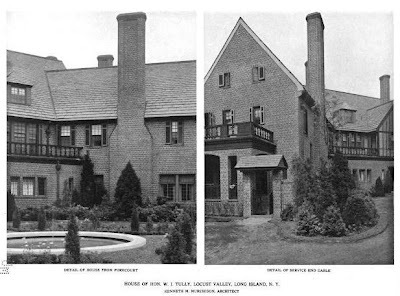 'Almar', the William John Tully estate designed by Kenneth Murchison c. 1916 in Mill Neck. Tully, an attorney, was a New York State Senator (1904-1908) and general solicitor for the Metropolitan Life Insurance Company. Click HERE to see 'Almar' on google earth and HERE on bing. The house has been for sale for quite some time and listing photos will follow tomorrow. I agree with Archibuff -- nice house where the exterior bones have pretty much been left alone, beautiful brickwork, interesting [& nicely done] floor plan -- that 'X' creates some interesting lines of sight. Too bad this house lingers on the market. From the aerial views the only thing I see wrong with it is that house to the west, that's also on the driveway up to 'Almar' is way too close. On one hand, it's on the garage / service side of the house so being closer is not as big of an issue; but on the other hand an owner of 'Almar' placed both the swimming pool & tennis court in this aready crowded space. It would be great if the acreage around 'Almar' could be rearranged ... but too late now. considering the prices of some estate homes, this one at $4.9M is in excellent condition, renovated and updated has a very good price point plus the interiors are wonderful. However it does not have the two storey marble lined entry hall, 30 foot high vaulted ceilings, mega sized media room, jacuzzi jetted whirlpool tub with waterfall, a 10 person shower stall and restaurant sized kitchen with a 16 burner stove so it unfortunately languishes on the market. Doesnt anyone appreciate quality construction anymore? Doesn't anyone appreciate quality construction anymore? In fairness, the lot is a mess. When the parcels were sold off, it was done in a reckless and unnecessary way. This lot is not a mess. It's our house and the lot is just right. On only four acres, it achieves complete privacy. While I agree that the tennis court can go or the house next door could be a little farther away, the house makes it all worthwhile. It is built with all steel structure and the walls are 18 inches thick. 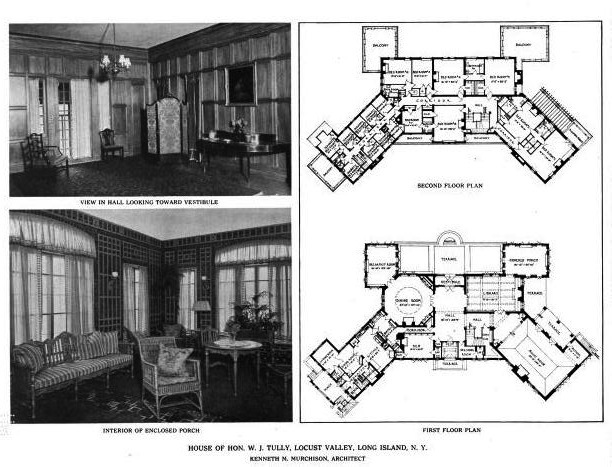 They don't build like that anymore. The house remains relatively intact including the old servant rooms. Though all modern conveniences have been added. It's living in a piece of history. Alice Tully of Alice Tully Hall at Lincoln Center grew up in this house. Iwe are lucky to live in it. And I guess we have been lucky that no one has bought it. It's truly an amazing house. I played in the front and rear fountains as a child. My grandfather, John B. Dawson, Sr., owned this house in the early 1960's. Though my memories are few, they are fond. I have loved this home as part of my family history, and have yet to see the inside as an adult. First Granddaughter of JBD, Jr. I have photos of myself playing in both the front and rear fountains, as a child. My grandfather, John B. Dawson, Sr., owned this home in the early 1960's. They later moved to Central Park South where they lived for many years, retiring from Wall Street to Vero Beach. I wish you as much fondness and happiness in that unusual and rare home. My father and his siblings love to retell stories of "old man Tully's ghost" in the master shower; a multi-headed shower where my grandfather would frequently find all the heads turned on full blast for no apparent reason. Too, are the stories of John and Martha Venable, their driver and cook, respectively, who would often hear odd noises and experience the inexplicable all with good nature and open minds. 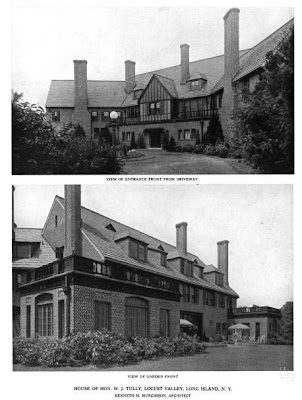 At the time the Dawson's owned Almar, the 8-walled room was a music room and had been such for a long time. My grandfather built both a small airplane and a car in that basement. First Granddaughter of JBD, Sr.